This week, we will focus on loving kindness. 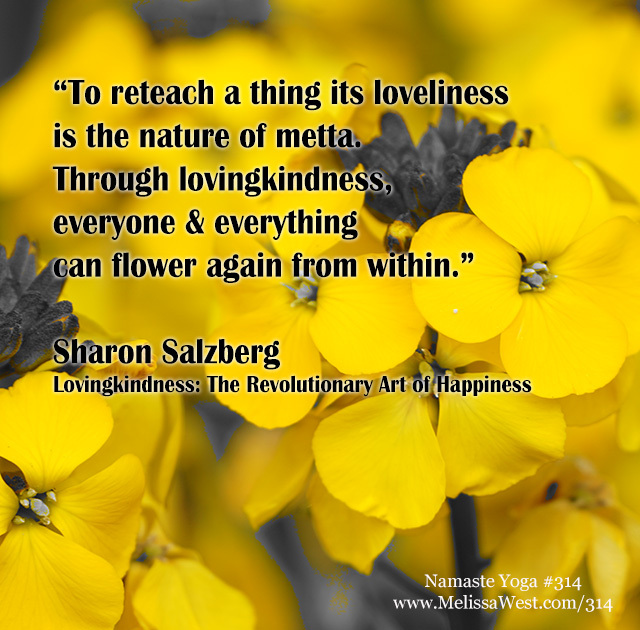 Sharon Salzberg describes loving kindness as a deep knowing of our interconnectedness. That our lives have something to do with one another. We live in a world now that gives the illusion of connection. Social media and our electronic devices allow us to compose, edit and revise our lives as we would like to present them to the world. We are used to a constant feed of information and entertainment so that we never have a moment to be connected ourselves, our boredom. Sherry Turkle, author of Reclaiming Conversation, says we have become a Tribe of One, loyal only to our own party. The presence of our electronic devices although on the one hand have this tremendous potential to bring us together, are also leaving us feeling less connected and less invested in each other. “Recent research shows that people are uncomfortable if left alone with their thoughts, even if for a few minutes. In one experiment people were asked to sit quietly – without a phone or a book – for fifteen minutes. At the start of the experiment they were also asked if they would consider administering electronic shocks to themselves if they became bored. They said absolutely not. No matter what, shocking themselves would be out of the question. But after just six minutes alone, a good number of them were doing just that.” (from Sherry Turkle’s book Reclaiming Conversation). Sherry Turkle says that we are so accustomed to the illusion of connection through technology, that being alone has become a problem that technology solves for us. She goes on to say, that afraid of being alone, we struggle to pay attention to ourselves. The problem she says, is when we can’t find our own center, we lose confidence in what we have to offer each other. I feel this is incredibly relevant to the present moment teachings of loving kindness. Loving kindness is a practice by which we connect first with ourselves. Our well may be empty. But drop by drop it begins to fill, and over time, what may have begun as feeling as though we have nothing to give, shifts into a generosity of spirit where we have more than enough to give to others. Loving Kindness begins with friendliness towards ourselves. Not just the parts of ourselves that we like, but all parts of ourselves. 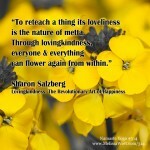 Sharon Salzberg describes it as beginning as a practice of intention that transforms our field of being from one of fear to one of connection. Instead of seeing ourselves as separate or abandoned, we will begin to see ourselves connected to the fabric of life. With the practice of loving kindness meditation or metta meditation, the phrases of loving kindness are the practice by which we come back to our center. in a rhythm that is pleasing to your heart and over time the meaning deepens. The power of the practice is in gathering your attention. You are slowly creating the conditions to see your world not distorted by your own fears and biases. You are creating the conditions for loving kindness to emerge. It is a practice in patience and opening up to what is already inherent in your nature. Today’s question to answer in the comments is: How will you connect with yourself with kindness this week? We began the teachings on loving kindness this week. If you would like my favourite phrases of loving kindness meditation so you can practice loving kindness meditation at home then you can opt in below to receive a beautiful infographic with those phrases.